June 4, 2016 is American Hiking Society’s National Trails Day, the country’s largest celebration of trails. The purpose of National Trails Day is to promote the importance of trails in the United States and showcase the wide array of trail activities; hiking, biking, paddling, horseback riding, trail running, bird watching and more. Cayuga County’s 65 miles of multi-use trails allow you access to the natural world for recreation, education, exploration, and even inspiration. Trails support good physical and mental health and provide us with a no cost (except for a decent pair of walking shoes) way to breathe in fresh air, get our hearts pumping and escape from everyday stresses. Owasco Flats Trail – Located at the southern end of Owasco Lake, Owasco Flats is a large fern and willow marsh, and flood plain forest with the Owasco Inlet running down it’s middle. You may catch a glimpse of over two dozen rare species of birds while hiking through the Flats so be sure to bring the “For the Birds” guide to bird watching in Cayuga County along with you! This multi-use trail traverses woodlands, farmlands and wetlands, connecting the towns of Cato and the Village of Fair Haven, along 14 miles of abandoned railroad bed. Hiking, biking, horseback riding and ATV use (4/15-10/1) are all allowed. The historic Erie Canal towpath is a recreational trail for hikers, bicyclists, and horseback riders. Highlights of the trail include the Centerport Aqueduct, Lock 52 and Richmond Aqueduct, reminding us of the Erie Canal’s glory days. This multi-use trail extends through the town of Sterling along an abandoned railroad be d and permitted uses include hiking, biking, and ATV use (4/15-10/1). The trail extends east and west through neighboring Wayne and Oswego Counties, so you can travel this trail several times and enjoy various vistas from wooded hilltops to the Lake Ontario shoreline. The Auburn-Fleming Trail follows a two-mile stretch of abandoned railroad bed along a network of streams and wetlands. The trail is fairly flat so it is a good choice for novice hikers. This unique park features glacially formed bluffs with scenic vistas of Lake Ontario. The trails wind through a varied terrain of wetlands, vernal ponds, woodland, creaks and meadows home to a wide variety of wildlife and plants. 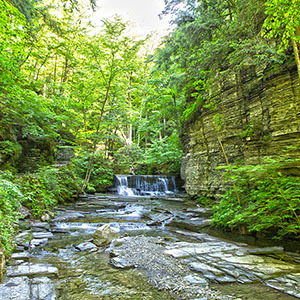 Located at the southwestern end of Skaneateles Lake, this state forest has over 13 miles of multi-use trails, making it very popular for hikers and bikers. Don’t worry – there are no bears in Bear Swamp! 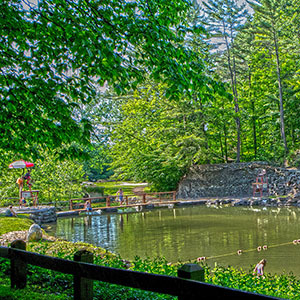 Many of Cayuga County’s towns and villages also maintain lovely parks and trails for hiking and biking enthusiasts. Visit http://tourcayuga.com/attractions/outdoors-recreation for a full array of recreational opportunities.